The 'Originals' are produced by DG as reissues on CD (with improved sound) of Legendary Recordings from their catalogue. It is good to see again a recording which truly is a legend and in sound which is so good. 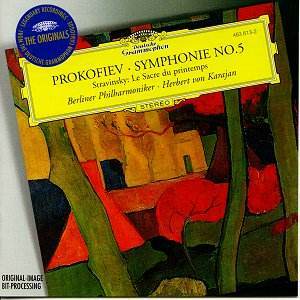 There are many collectors who find it hard to see any merit in the recordings of Herbert von Karajan; however , if challenged I think you will find most of them will be prepared to find an exception in his famous 1969 recording of the Prokofiev 5th Symphony. This made a big impression when first released and I don't think it has been surpassed since. The Symphony was written in 1944 when the war at last was going well in the fight with the Nazis and it has been described by the composer as a celebration of the grandeur of the human spirit. It is a lyrical work tempered by Prokofiev's late 'Soviet' style with at times heavy use of brass which can so easily make it sound rather course. Karajan however manages to unravel all the complex strands of the work with tonal sophistication which is outstanding. One of Karajan's greatest strengths is his ability to hold the architecture of a long complex work so that every phrase and every tempo sounds right. It is many years since I had heard this recording and I found myself almost laughing out loud at the intense good humour of the allegro marcato and the jokes in the final movement. The two slow movements come across with great fervour. The recording manages to improve on that of the original LP. This is a must for any collection which includes 20th Century music. I had never associated Karajan with Stravinsky, and famously Stravinsky had put the boot in in relation to Karajan's 1964 recording of the Rite of Spring in a most devastating way. The conductor did not perform the work for several years and the present recording clearly was done after much soul searching, and I suspect, after deep study of Stravinsky's own recording (which in tempos and dynamics, but not timbre, it is close). The Rite of Spring is a landmark composition and still represents a level of modernity beyond enjoyment for many people. It was only a few years ago that an old gentleman walked out of a concert at a recorded music society when I played it! Once thought almost unplayable, it is now routinely regarded as a virtuoso piece to show off the skills of a conductor and orchestra. The work is famous for the strident savagery of the first part, however the quieter sections in the later part can sound rather boring in some performances. The richness of sonority of the opening passages, whilst pleasing to the ear, raises the question of whether Berlin Philharmonic is the right orchestra, at least under Karajan, for this rather lean score (as conducted by Stravinsky himself). However as the performance proceeded I found myself enjoying it more and more. The playing and balance is immaculate, every instrument can be heard and when needed the orchestra attacks with crushing ferocity. I found myself revelling in brilliance of playing and some of the strange tunes which had passed me by in other performances. There was never any question of dullness in the quieter parts. Whilst not perhaps the most authentic sound, this proved to be a beguiling performance in a superb recording which is most enjoyable.